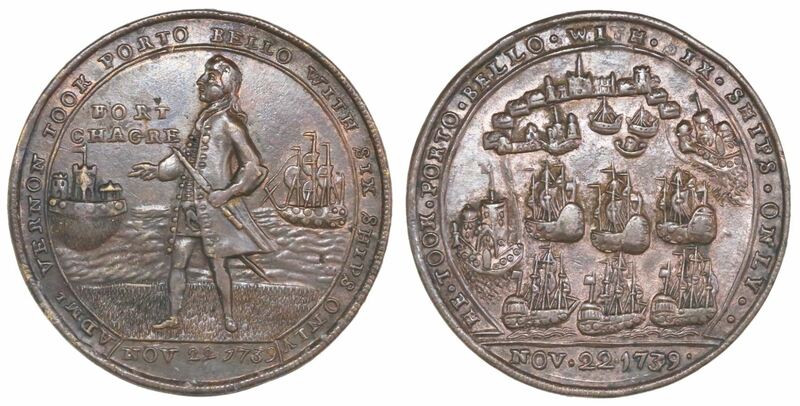 If the heart of collecting is visual and intellectual stimulation mixed with historical study, then the “Admiral Vernon” medals crafted in England in the period 1739-1741 are the perfect collectibles. The sheer number of different varieties of these medals makes collecting them both challenging and feasible. Fascination with these historic pieces has spawned more than a dozen studies over the past 180+ years, culminating in the book Medallic Portraits of Admiral Vernon (2010), by John Adams and Fernando Chao (the “AC” reference we quote in our lot descriptions). With this well-illustrated book alone, one can spend many enjoyable hours attributing each piece down to exact die details. 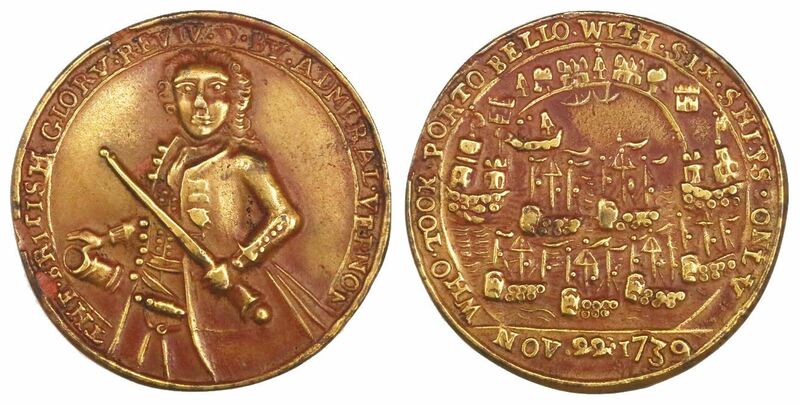 The biggest challenge with these medals is condition, as they were heavily used and abused, which makes the present offering comprising the collection of Richard Stuart an exceptional opportunity. The conflict began with the capture and torture of the British merchant ship captain Robert Jenkins by the Spanish off Havana, Cuba, in 1731. His alleged punishment for smuggling was the removal of one of his ears, which he physically produced for British Parliament in 1739, setting off what became known as the “War of Jenkins’ Ear” starting that year, effectively “Great Britain’s first protracted naval war in the Americas.” In a burst of vengeful braggadocio, the experienced British admiral Edward Vernon reportedly said he could take the Spanish port of Portobelo, Panama, “with six ships only,” the larger goal being to disrupt the flow of Spanish shipping of treasure from the New World. It is easy in retrospect to see why the Spanish viewed this as simple piracy under the guise of war. While the British lauded Vernon as a hero and the Spanish vilified him as a pirate, the truth is somewhere in between. Using Jamaica as a base of operations, Vernon made good on his boast in December of 1739 (with Commodore Charles Brown), but from there things went south. While news of his victory at Portobelo was reaching England, Vernon’s squadrons were battling storms and the threat of a French fleet. Vernon’s subsequent attack on Cartagena, Colombia, in March of 1740 was unsuccessful and resulted in his taking a sort of consolation prize: Fort Chagre in Panama (near Portobelo). More than a year went by, as both sides beefed up forces, the British side (including ships under Rear Admiral Chaloner Ogle) eventually becoming “the largest force yet deployed in the West Indies.” A renewed assault on Cartagena utilizing over 100 ships and 12,600 troops (almost a third of which were colonial Americans, thus representing “the first deployment of Americans abroad”) began in the spring of 1741 and delivered Vernon’s ships and foot-soldiers into the harbor before yellow fever and miscommunication between Vernon and Brigadier-General Thomas Wentworth forced a retreat. 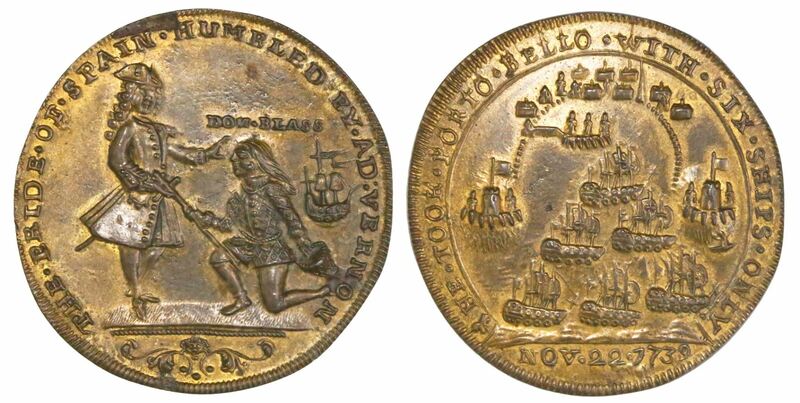 Most interestingly for us numismatists, upon breaching the harbor the boastful Vernon had already sent word back to England of his “victory” at Cartagena against his Spanish counterpart, Admiral Blas de Lezo, spawning a new round of medals dated 1741. Vernon’s final attempt was against Cuba that same year, initially planned for Havana (and, once again, reported back to England as a victory there) but instead visited upon Santiago on the south coast and successfully repelled by the Spanish and their mosquito-borne partner, yellow fever, as in Cartagena. In sum, Vernon’s only victories were in relatively quiet and unimportant Panama. The medals themselves depict all these events in the most favorable light possible for Vernon, to the point of comical misrepresentation. 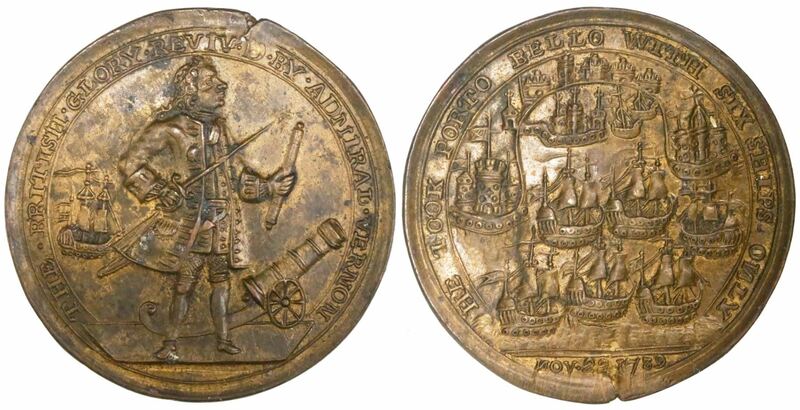 Beyond the basic organization based on location (Portobelo, Fort Chagre, Cartagena and Havana), these medals are grouped according to legends (on both sides, often with errors) and figures of Vernon and the other players in the events (often almost cartoon-like in quality), in addition to icons like cannons and ships and scenery like forts and cities (most depicted without regard to perspective or scale). Minute details like where Vernon’s finger points and where a church steeple sticks up are integral to pinpointing exact dies. Since so many of these medals are well worn, it is not always to make attributions right away, but almost always one small, visible detail can make the difference. Besides a few examples in silver and tin (plus a unique specimen in gold), the primary metal used to make these pieces was copper alloyed with a variety of other metals, like zinc and tin. Often the generic term used is brass or bronze, but more specific references mention “pinchbeck,” referring to a proprietary alloy invented by a family of clock and watchmakers in London named Pinchbeck, who advertised their metal as resembling gold in color and ductility. Presumably the Pinchbecks were the makers and purveyors of the Vernon medals. Relatively few of the medals are signed by engravers, most of whom are unknown. Overall it is clear these medals were made in haste to satisfy and capitalize on demand from a brief hysteria. 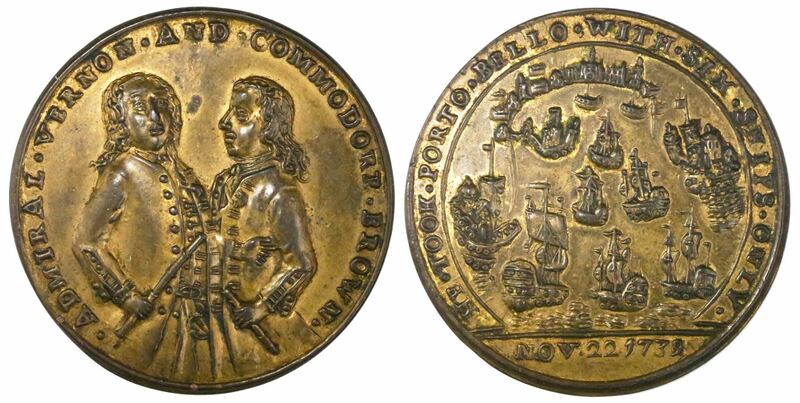 While every collector seeks a reason or connection to collect a certain thing (like Richard Stuart’s connection with Panama for these medals), the Admiral Vernon medals can and should be collected simply for their “collectibility” as a well-studied series that has been appreciated by top numismatists for over 180 years.